Two-goal Peterborough Northern Star striker James Hill-Seekings in action against Kirby Muxloe. Photo: Tim Gates. Peterborough Northern Star manager Rafa Mazzarella is thrilled with the progress of his young United Counties Premier Division side. A complete overhaul of the squad in the summer inevitably led to a sluggish start to the campaign for the city side, but four wins and a draw in the last six games has pushed Star up to a respectable 12th-place. Holbeach were awarded a penalty against Peterborough Sports after this incident. Photo: Tim Wilson. Modest Mazzarella may be doing his side an injustice by declaring he’d be happy to finish where they are now. “I’d honestly settle for a mid-table finish,” Mazzarella said. “I pretty much only kept goalkeeper Dan George from last season’s squad. It’s taken time for a young squad to get used to the demands of the Premier Division. “But we’ve added a couple of experienced lads recently and we’ve hit some decent form. Josh Moreman is all smiles after scoring for Peterborough Sports at Holbeach United. Photo: Tim Wilson. Centre-back Matt Cox’s arrival from March Town helped shore up Star’s defence. Dashing forward Matthew Barber made the same move at the same time and he’s also made a positive impact. Teenager James Hill-Seekings scored both goals in last weekend’s 2-0 win over Kirby Muxloe. Star host lowly Harrowby tomorrow (November 27). Leaders Peterborough Sports, entertain sixth-placed Harborough on Saturday. Sports are running away with the league as their 4-1 win at Holbeach United on Wednesday (November 23) moved them eight points clear of the rest. Deeping Rangers take a 14-game top-flight unbeaten run to Rothwell Corinthians tomorrow. Action from Peterborough Sports' 4-1 win at Holbeach United (stripes). Photo: Tim Wilson. 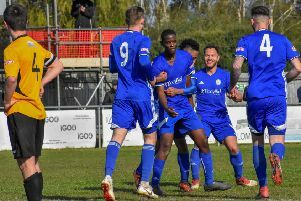 Stamford AFC will make another attempt to make an upwardly mobile move in the Evo Stik Northern Premier Division campaign at Gresley tomorrow. The Daniels are currently 19th, but have numerous games in hand on most of the rest of the division. Third-placed Spalding, who played six more league games than Stamford, travel to Basford. Division One South: Basford Utd v Spalding Utd, Gresley v Stamford. Premier Division: Desborough Town v Huntingdon Town, Northampton Sileby Rangers v Holbeach United, Peterborough Northern Star v Harrowby United, Peterborough Sports v Harborough Town, Rothwell Corinthians v Deeping Rangers, Wisbech Town v Eynesbury Rovers, Yaxley v Oadby Town. Division One: Blackstones v Burton Park Wanderers, Woodford United v Bourne Town. Division One: March Town United v Braintree Town Res, Wisbech St Mary v Halstead Town.